Here are some practical strategies you can try the next time an difficult customer phones in. When you first pick up a call, it is likely the customer will be feeling vulnerable and unsure about whether their issue will be resolved or not. Always acknowledge the complaint in hand by repeating it back to the customer. This will reassure the customer that they have your full attention and that you understand their problem. Don’t over-apologise. No one wants to hear you say “I’m sorry” a thousand times. Instead, say “I do apologise” (which sounds more professional) and then focus on finding a solution. When you are confident that you understand the complaint in hand, the Feel, Felt, Found approach can help you reassure the customer that you are on their side and have a solution which will work for them. Another way to calm an angry customer is to listen to their complaint and promise that you will personally help to resolve it. To show that you are being sincere, you should also give out your name and employee number. Wrap up the call by explaining to the customer that you will chase this matter up for them and call them back by the end of the day to update them on their case status. Even if the issue is yet to be fully resolved, calling back when you said you would will help the customer feel confident that their issue is being taken seriously. Don’t give out false information or lie just to escape the customer’s bad temper! This will only make the problem worse in the long run. Instead, set realistic expectations for the customer when discussing next steps and time frames. It is always better to under-promise and over-deliver than it is to over-promise and under-deliver. Sometimes a customer will demand to speak to a supervisor the second the call is answered. This isn’t always practical or necessary. Here are some simple steps to resolve the customer’s issue without escalating the call. The best thing to do when a customer makes this request is to say “yes, of course”. This will help to appease them as they will feel that their request is being taken seriously. Then listen to what the customer has to say. By asking a leading question and taking control of the call, you can get the customer to assist in helping you resolve their issue without getting a supervisor involved. When faced with an abusive caller, you should remain calm and professional – and give the customer a chance to change their tone. It can be helpful to maintain a low, even tone as you attempt to take back control of the call. If you pick up the phone to an abusive caller, continue as normal, listen to the problem and empathise. It is important to let the customer speak – regardless of whether they drop in the occasional F or C word. You may find they calm down once they have had a chance to get everything off their chest. If the caller shows no signs of calming down, suggest they call back when they can better control their language. If the caller continues to stay on the line and use abusive language, it is in everyone’s best interests to terminate the call. Have you seen success with any of these techniques? 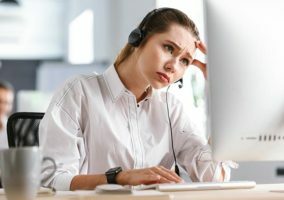 How do you handle angry customers in your contact centre? Dealing with an angry customer is like preparing for a chess match. Here are the 10 things I preach to my team. 1. Stay focused on the task. 2. Do not get pulled into the emotion of the moment. 4. Zone in – not out. 5. Do not make it personal. They have no clue who you are. You just drew the short straw and got the call. 6. What you want doesn’t matter nearly as much as what they need. That is to be heard. 7. Ask good, on task & smart questions. 8. Avoid holds as much as possible. 10. Follow up with them after 24-48 hours to ensure they have gotten what was needed. Human behavior is not an exact science but there are some common predictors. The best that any of us can do is to put ourselves in the best position to give the customer what is needed without giving away the farm. This is why ‘Quality Customer Service” is talked about by many but mastered only by the few. The starting point for me is to think about the customer. A customer may appear angry but this might be masking a vulnerability or that the customer is in a Vulnerable circumstance. When two humans communicate with each other there is two messages being sent. Both are important, but one MUST be addressed before the other can be done effectively. Those two messages are EMOTION and KNOWLEDGE. The primary focus of every agent when taking a call, especially when the customer is escalated should ALWAYS be to address EMOTION first. When a customer sighs or sarcastically chuckles they are doing so to send the listener a message. They are try to tell you there emotional state and WANT YOU TO ACKNOWLEDGE IT. They are communicating to you they feel and you have not addressed it to their satisfaction. If someone is continuously telling you how angry they are, they are not going to let you move forward unless they feel you truly understand their emotional state. You will never be able to deescalate a customer until the customer feels that you truly understand the emotional message they are sending you. Once this message is address then and only then can you effectively communicate the KNOWLEDGE needed to resolve the issue. For those wanting to get a better understanding of this look up the phrase ” Amygdala Hijack”. When one understand the basic theory of Amygdala Hijack and how it effects each on of us it becomes much clearer of what is causing the roadblock between agent and customer resolving an issue. A book, “Just Listen” by Mark Goulston, explains how we can deescalate most customers and effectively improve that experience for not only the customer but the agent as well. Another aspect to understand is how emotions trigger us to reflect back the same emotion. When a customer is angry we unknowingly start to become angry ourselves which in turn triggers more anger. Listen to calls of angry customers and you will almost always hear the agent start reflecting back the anger of the customer. Thats you Amygdala starting to take control of how you respond to the customer. When I learned about this I was amazed at how I started noticing my responses to escalated calls when the customer was angry. I could literally feel my body tense and my emotional state change. And that was me just REVIEWING a call. I was not even part of the conversation. I no longer get angry on a escalated call with a customer and I rarely have a customer end a call feeling angry themselves. Once the customer understands I truly get how angry they are and why they allow me to assist and advise them of the “what” and “why”s I need to advise them of. It has made my job, as well as the agents I have coached become so much more enjoyable. Now I am in a position where I can assist and coach agents to improve their calls and customer experience. And this knowledge has been the most effective part of my, and their success in improving. Its amazing to watch a agent on the verge of quiting due to the stress of angry callers become more confident in handling these calls which improved their customer service experience metric. There is so much more I have learned and been able to practice because every day I go to work I can see how this knowledge can be used to improve almost everyone I get to team up with. The oddest part of this is that this knowledge is considered a “soft Skill” if considered at all. I feel that this should be taught from day one in training agents because understanding how we communicate effects every interaction we have with each other at work or at home. I am delighted to have found this website. Great job! If the caller is swearing at our operators the operator only has to tell the caller that if they swear again they will terminate the call. If the caller doesn’t calm down the operator will hang up. Generally they’ll calm down and call back. Forcing operators to stay on the phone with abusive or swearing callers is completely unacceptable for us, as it places the operator in a hazardous environment.